For the last several days, we have been experiencing record-breaking low temperatures in our part of the world. On the positive side, forecasters had given us plenty of warning, so I was able to head out to the local stores last week to stock up on lots of food before the arctic blast set in. All in all, I did pretty well. I purchased lots of fresh fruits and vegetables, plenty of oatmeal and other breakfast items, baking supplies to make fresh bread and a few goodies for my home bound troops. 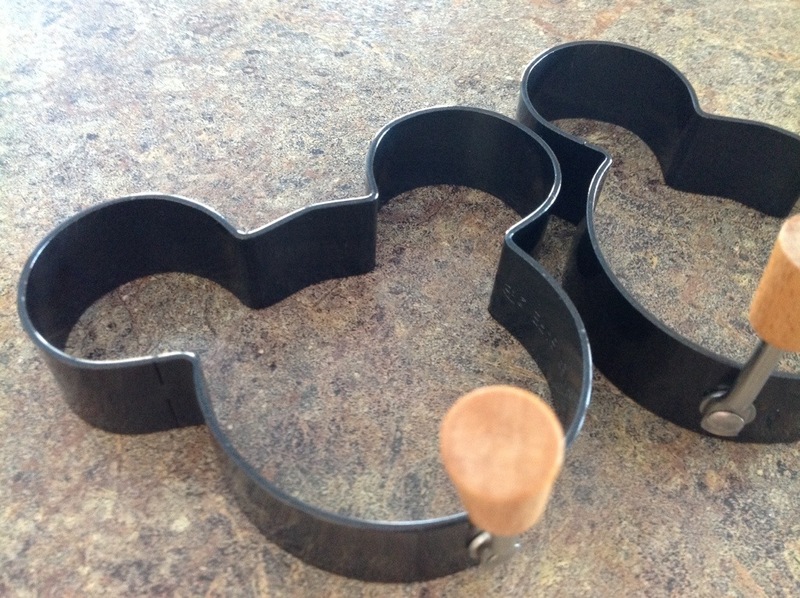 Yesterday, M pulled out our set of Mickey Mouse egg rings and asked if we could make pancakes for breakfast. The rings are meant to mold eggs into the curved shape of a Mickey Mouse head but we usually use them to shape pancakes. We whipped up a batch of our tasty, satisfying Hearty Oatmeal Pancakes before heading out into the blizzard-like conditions to shovel the newly fallen snow. After dropping the first batch of batter into the molds, I checked to see if we had an ample supply of maple syrup for the pancakes. To my dismay, we only had a drop of syrup left in the bottle. “No problem”, I said to myself… “I will make a batch of my own maple syrup”. I had discovered this recipe last year, around the Thanksgiving holiday, when we had sleep-over guests and had run out of syrup. I quickly scoured my cookbook collection for an appropriate substitute. I ended up making this adapted recipe and I also heated some of our Homemade Concord Grape Jam to act as a flavorful, delicious, topping as well. I keep the syrup recipe close at hand for we always seem to be running out of maple syrup in this house. Enjoy the recipes and stay warm! Combine oats, flour, sugar, baking powder and salt in a mixing bowl. In a separate bowl, combine eggs, milk, oil, and extracts. Stir into dry ingredients; just until moistened. Pour batter onto lightly greased, hot griddle. Flip pancakes when bubbles form on top of pancakes. Continue to cook until second side is golden brown. Bring the water, sugar, and brown sugar to a boil in a saucepan over medium-high heat. Reduce heat to medium-low, and stir in the maple and butter flavored extract; simmer 3 minutes longer. Serve warm. Refrigerate remaining syrup. The syrup sounds very much like what I was raised on, except Mother didn’t add any maple flavoring. I always loved it. Yes, Lillian… It’s quite tasty and the kids seem to like it better than store bought. Its a llittle less expensive too! Thanks for your comment.. All the best. Don’t we all! It’s certainly warmer down there than it is in my neck of the woods! Third day of school closings due to record low temps and icy conditions…stay warm! The temp finally got above zero here today – heat wave! We are getting a bit stir crazy up here in the north… We’ve been notified that school will be closed again tomorrow. Unfortunately, my office is open tomorrow so I will brave the cold, snow and ice and make my way to work early tomorrow morning. I so wish we were experiencing the warmth of Australia right now but we will make due…I’m told slightly warmer temperatures are on the way! Thanks, Dani… Be well! A homey, warm breakfast on these chilly days! Love the mickey mouse shape, too! Thanks, Haley! 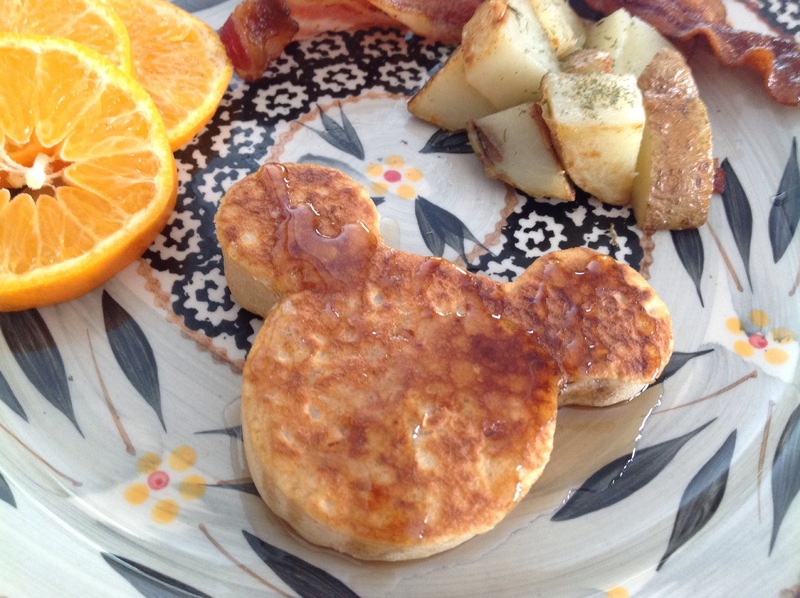 Yes, it is a comforting recipe and we love the Mickey shape as well. We vacation in Disney every year and try to find some trinket to remind us of our yearly trip! Stay warm and toastie! Will be trying these. I can happily exist on pancakes and syrup in the winter. Haha… It’s a great way to sneak some whole grains into your diet. Kids won’t notice the addition of oats…really a hearty recipe. Stay warm! Thanks for your comment! You are so smart to stock up before your artic blast. Fruits/Veg for health and baking staples to keep you busy. 🙂 These little pancakes are just too cute and healthy, too. As for the maple syrup… Brilliance. Who knew you could make your own in a pinch? I hope you guys stayed cozy and things are warming up. I’ve been thinking about your last post about “The Ladies”. I tried to comment on your blog after watching the newscast but I received an error message every time I attempted to comment. I am headed over to your site now to see if things have straightened out. The arctic blast played tricks on our internet so maybe the problem was on my end! That Looks Gorgeous! I would love to eat that right now!. Thanks for your valued comment! This pancake mix is easy to put together and you can have pancakes in no time at all. I have even tried using heavy, well-made cookie cutters to make holiday themed pancakes and it works really well. Have a good day! Cookie cutters come in handy for shaping fruit, finger sandwiches, and pancakes. For some reason, food looks a little more appetizing when formed into cute, bite-sized portions. Have a good day! Gosh, Jocelyn…thanks for your kind words. This has been a great little adventure of me and I am so glad to have met so many people through the wordpress feed. Thanks for stopping by…Have a great day! I hope you enjoy them. Let me know how they turn out. Thanks for stopping by.